I’m on several mailing lists for marketing, research, and development and recently got an interesting mailing from Kimberly Castleberry of Just-Aks-Kim.com titled “Reflecting on Freedom.” Some wonderful advice for entrepreneurs litter the whole email, and I think it’s important to share some of that as it fits nicely with some of my ideas. Every entrepreneur goes through it. Almost no one that builds a sustainable business succeeds on their first (or even their third try). Everyone has delays, failures, roadblocks, set backs, falling on their asses, hitting their knees in desperation, and finally, slowly seeing results begin to come together. People ask me for quick fix answers for income needs. I don’t have those answers because those things are rarely sustainable if their foundation is not already in place. What IS real, is possible, and is sustainable though is the building of a real business over time. How do I know this is possible? Because it’s accomplished daily by hundreds or thousands of individuals. I have many personal friends and acquaintances that have accomplished these things and there’s so many ways to get there that the amount of potential is almost overwhelming! But, if you’ve followed me awhile, you know that I get PISSED when people lead others on about earning potential that “others” have made (others who started out with a list and were already well into their business model and not on the same footing you are at the moment). Most of us start at ground zero and have to work our way up the ladder of success. And what some of you may think is ironic from someone in the performing business is how little I think audiences are a part of that model for success–at least when it comes to bigger organizations. As I said in my previous post, it has as much to do with understanding the environment (the “infrastructure”) within which you find yourself. Part of that environment are the venues. These are the real “audiences” for most performers. Or rather, venues are performers’ most important customers as much as audiences are venues’ most important customers. While having the ability to be a big draw (for audiences) can be very useful for getting into better paying venues, that doesn’t come overnight. You’ll first have to get into venues where you can start making your audiences, and in the end, different venues cater to different audiences. The ironic thing about the large performing organizations is that their biggest revenue source is some form of mass media–either recorded or broadcast media. With broadcast media, the actual viewers are not paying customers. Businesses are the paying customers, and they pay advertising bucks depending on the type of content the broadcast media company offers. In other words, the venue (broadcast media) needs content that they can more easily sell to their paying customers (corporations). It’s the same with live performing venues. They are looking for acts that they can sell to their paying customers (live audiences). In other words, a performing artist isn’t selling his show to the audience, he or she is selling it to the venue which will pay you for it if it thinks it can sell your show to the audience. Audience building could potentially be one of the least efficient ways of creating a sustainable business as a performer than any other activity. This is not to say that building an audience isn’t useful. Just not the only (and certainly not the first) way to becoming a successful performer. Granted, there are far more venues out there in today’s live performing environment than there may have been in the past. And in many ways, so very many of them are run by folks who are just like most of us–entrepreneurs who decided they really wanted to start a venue. In many cases, given the proliferation of live performing musicians, it is far too easy for these venues to get live entertainment for next to nothing. So this sounds like a great deal for the club owners, doesn’t it? They get a band and customers for that night, and have to pay very little if anything. But what they don’t realize is that this is NOT in their best interest. Running a restaurant, a club, a bar, is really hard. There is a lot at stake for the owner. You are trying to get loyal customers that will return because you are offering them something special. If you want great food, you hire a great chef. If you want great décor, you hire a great interior decorator. You expect these professionals to do their best at what you are hiring them to do. It needs to be the same with the band. You hire a great band and should expect great music. That should be the end of your expectations for the musicians. The music is another product for the venue to offer, no different from food or beverages. When a venue opens it’s doors, it has to market itself. The club owner can’t expect people to just walk in the door. This has to be handled in a professional way. Do you really want to leave something so important up to a musician? This is where the club owner needs to take over. It is their success or their failure on the line, not the musician. The musician can just move on to another venue. I’ve played places where for whatever reason only a few people have walked in the door on a Saturday night. The club owner got mad at me, asking where are the people? I turned it around on him asking the same thing? Where are all the people? It’s Saturday night and your venue is empty. Doesn’t that concern you? What are you going to do about it? Usually their answer is to find another band with a larger following. This means the professional bands get run out of the joint in favor of whoever can bring in the most people. But here’s where the club owner doesn’t get it. The crowd is following the band, not the venue. The next night you will have to start all over again. And the people that were starting to follow your venue are now turned off because you just made them listen to a bad band. The goal should be to build a fan base of the venue. To get people that will trust that you will have good music in there every night. Instead, you’ve soiled your reputation for a quick fix. If you asked a club owner, ”who is your target demographic?” I doubt they would answer ”the band’s friends and family.” But yet clubs operate like it is. … would you expect the chef’s friends and family to eat at your restaurant every night? How about the dishwasher, the waitresses, the hostess? Or how about the club owner’s friends and family? You see, when you start turning this argument around, it becomes silly. But this is increasingly the climate we are finding. There are so many venues out there and so many musicians out there: many of whom are new entrepreneurs and have taken a more DIY approach to business. And while a few of both groups will find some measure of success, whether through sheer hard work or sheer luck (or some combination of both), the majority won’t. That DIY drive, however, has its drawbacks. While it is nice to do everything yourself, I think it’s important to realize that those musicians who do have a “team” (managers, booking agents, lawyers, etc.) tend to have much higher revenue than DIY independents have. At least two and three times the revenue on the average! The Artsist Revenue Streams website is still analyzing the data from their most recent survey (n=5371 –not a bad sample size, relatively speaking) and are coming up with intriguing (and in some cases, counter-intuitive) conclusions to very specific questions about musicians’ livelihood! In other words, what we might think will increase our revenue, may not actually be the actual best practice for increasing revenue! And Eric responded with an important point: ” Of course, before you can afford a team, DIY can be the only option.” And for most people the DIY ethic may be all they really want. I suspect that while many people may have dreams about being a live performer, very few of them have that desire once they realize what that entails, and many more are content with just being a “part-time Performer” or a “weekend warrior” as we musicians sometimes refer to those who gig on weekends rather than during the normal workweek. There’s nothing wrong with this at all, and making music can be a very profitable secondary or supplemental source of revenue. And for most, this is how to get started in music–as a side project until the musician can make the jump into making a full time career or profession. But without the right kind of effort, that may very well be the only kind of musical career a musician may have. Let me give an example of how getting a relatively good paying gig without having an actual audience following can work. Not only had we not started any marketing and promoting the project–we actually didn’t even have costumes or [much] Klingon Music in our repertoire yet–which was one of the reasons we hadn’t started pushing the project. We landed the gig basically by word of mouth, primarily because the venue knew what it wanted–a Klingon Band for the “Sci Fi Day” event during their exhibit which ended up having a total attendance of 8, 263. Think about the implications of this. We [practically] had no product nor costuming (though obviously we quickly acquired both to the event organizers satisfaction–we did have to send them photos of the costumes); there was no marketing or promotional campaign; we had no audience specifically for this project (though a number of our fans knew about our plans); and we got hired to play for what ended up being many thousands of people. From the venue side of things, the folks who hired us knew what they wanted and knew they had an audience for their event and, in particular, for what they envisioned bringing in (i.e. a Klingon Band). Going back to my thoughts about knowing the environment or “infrastructure” — one of the reasons I pushed this project was precisely because I knew there was an audience out there for it that is, for the most part, untapped. 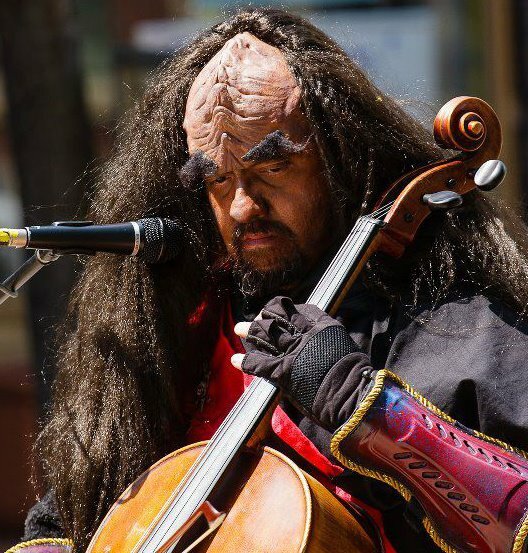 Sure, there are a few other Klingon bands out there, and at least one repertory theatre company doing a Klingon Opera (mostly in Europe), but no one really doing what we’ve been doing. We’ve since gotten our best paying, and highest exposure gigs through this project–and not at all through audience building, since that audience already existed. I took our experience in filling a different niche earlier in our career (as a Belly Dancer Band) and created the Klingon Music Project on that successful model with some modifications. This is not to say that audiences don’t matter–without them, venues wouldn’t exist in the first place to hire bands. I’m simply saying that most ideas regarding building a sustainable entrepreneurial musical career may focus far too much on an inefficient audience-building initiative–which is one of the reasons I’ve been blogging about large-scale organizations and what their relationship is to their audience. And as I’ve shown in the past few blogs, from the viewpoint of the performer (but not the venue) the audience plays a much smaller role in the sustainability of the large scale organizations. And from the viewpoint of the venue, what a musician may consider to be his or her audience may not be what the venue is considering its audience. In the end, the musician can either adapt to the venue(s) that exist; play in venues that aren’t necessarily concerned with its own audience building (ala Dave Goldberg) that seem to hope to get lucky in what might be the crap-shoot of the musicians’ ability to draw an audience; or build his or her own venue and learn how to deal with both sides of that audience divide.